There’s just something fun about gaming bits. This isn’t just a wooden cube covered in black paint. It’s ore from the deepest depths of the ancient Dwarven mines, which I will forge into swords and shields for my army! There’s so much imaginary potential for something so small and innocuous. I thought that I would share my collection of prototype bits and talk about what I generally use them for. I pretty much use these exclusively for worker placement games. They also come in handy as score trackers for just about any game which tracks points or progression of any kind. 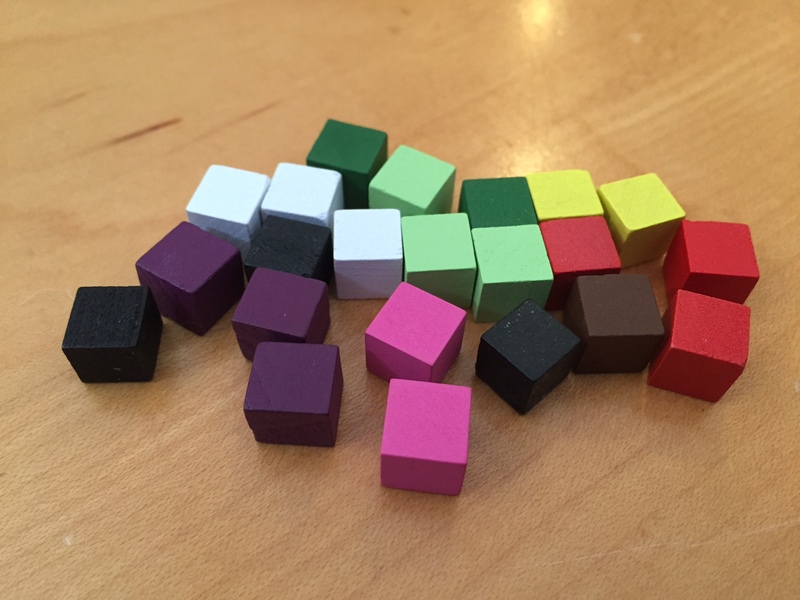 When I got my first batch ever of prototype bits for one of my worker placement games I only ordered one size of the standard meeple shape. As I was putting everything together I realized quickly that I had overlooked something. Each player has their own set of workers and knights, but I didn’t plan for a way to differentiate between those two unit types. 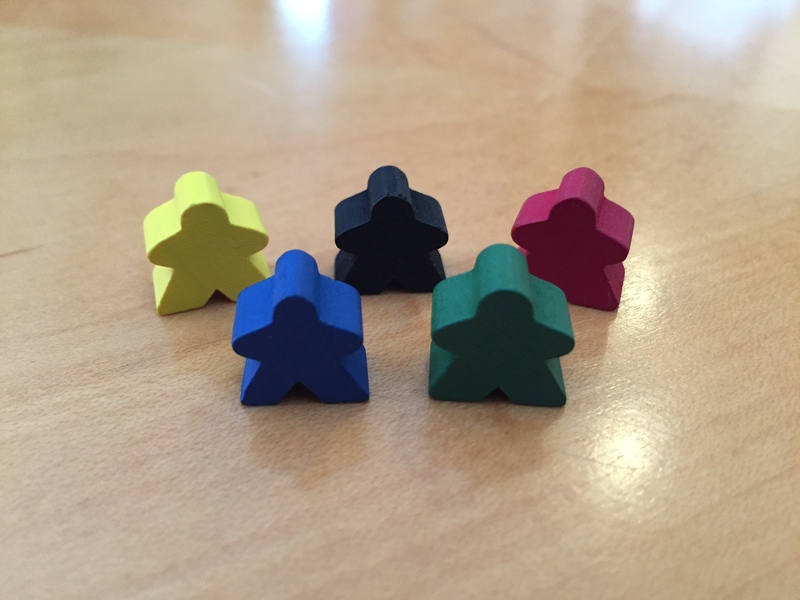 The fix I came up with was to use all grey meeples to represent knights, but painted a stripe of player color across the top of their heads so you could tell one player’s knights from another. Different sizes or shapes can be handy depending on the games you’re working on. These are probably the most flexible and useful of all the bits I have. They’re easy to grab and take up minimal real estate on a board or player area. I’ve used them to represent resources like ore, food, and wood in worker placement games. They’ve also been damage and stress in an adventure style game. These will give you great bang for your buck. I use these in a couple of games to track character or player health. They’re a recent addition to the bits collection. Several of my games involve characters taking damage. 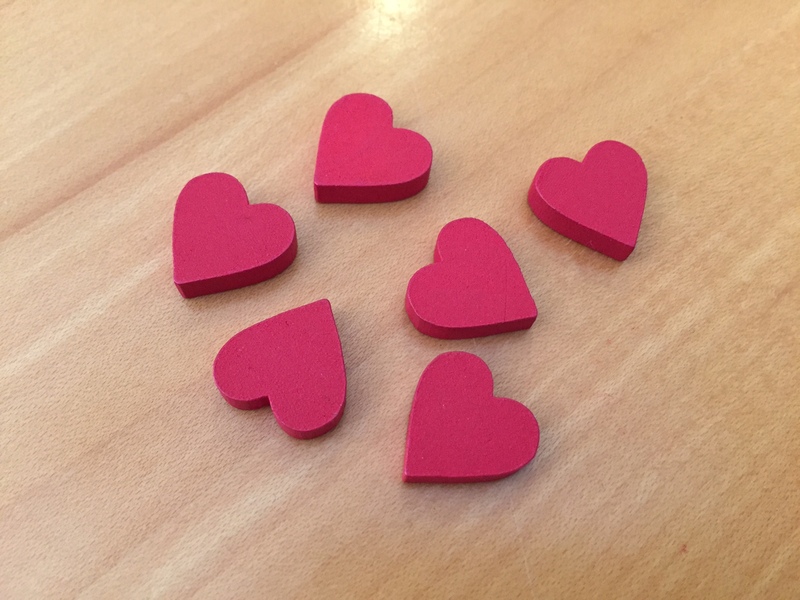 I also use hearts in a lot of my graphics to represent health and life points, so it just made sense to have some around. The only downside to them is that there aren’t many other uses for them due to their shape. I’ve found the wooden discs to be handy, but not quite as versatile as the cubes. Most commonly, I use the yellow ones to represent gold and money. I just recently bought some actual gold ones, so I’m looking forward to incorporating them into one of my worker placement games to replace the yellow ones. I think my favorite use for the discs is in place of what I think will eventually be a cardboard token. I’d rather not waste the time and effort to paste stickers onto and cut out cardboard when there’s an existing piece to use when testing. 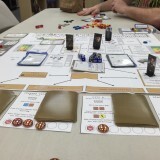 I can’t count how many times I’ve replaced and swapped out resources or tokens between prototype iterations. The less time and effort you have to spend on the physical aspects while testing the happier you’ll be. Oh man! I love how these things look! They can add such a slick looking and dynamic visual element to your prototype. I only just recently bought some and haven’t incorporated them into any designs yet. Looking forward to messing around with them though. 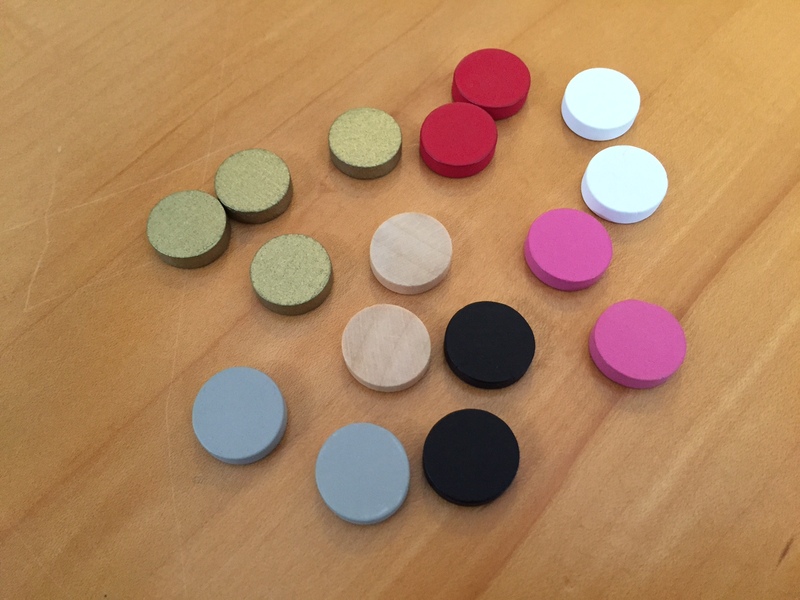 These are actually cheaper per piece than any of the wooden bits, but I don’t think they’re appropriate for every type of game. It just depends on what aesthetic you’re trying to convey. 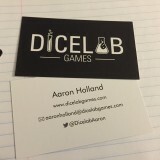 Most of us have lots of dice lying around. 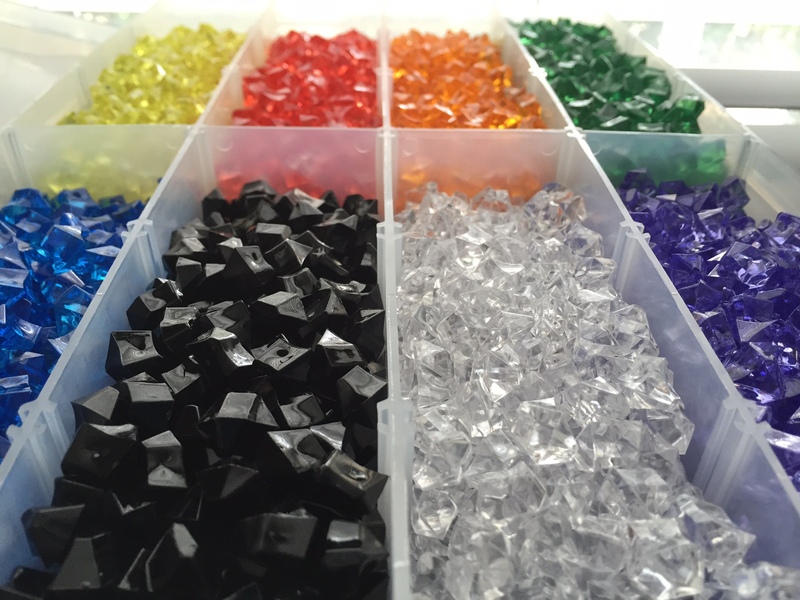 If you need more than a couple per player, or different colors to represent various resources, they’re not all that expensive. You can pick up a cube of 36 small dice from most comic and gaming stores for $7 to $10 depending on how fancy you want to go. I’ve actually used dice for a wide variety of mechanics other than just standard rolling. In my sci-fi co-op they represent scrap and other materials that you’re searching for. You roll the die when crafting to determine if you successfully convert it into other supplies. 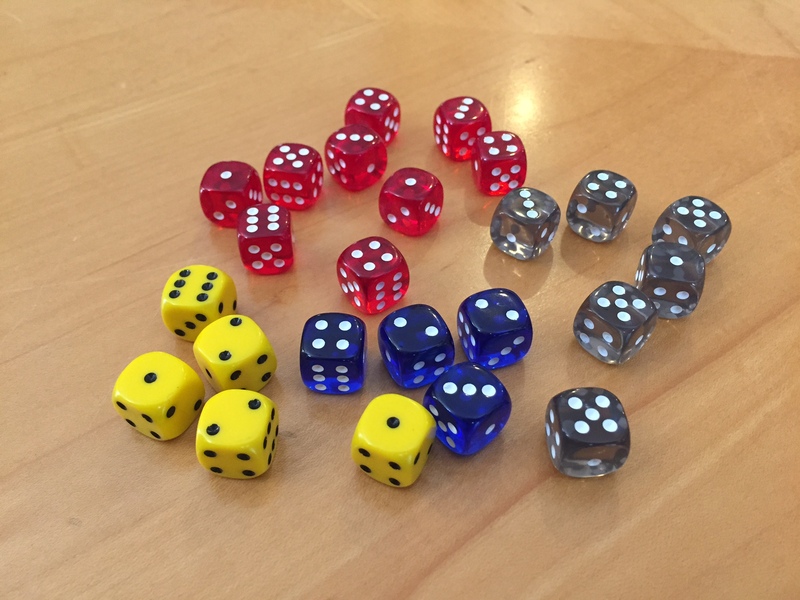 In a theme park game I’m working on, at the beginning of a season, you roll various numbers of three different colors of dice which represent tourists. The numbers lock in and you draft from that pool to put them into your park. All of my wooden bits came from Meeplesource.com. Acrylic crystals came from efavormart.com. 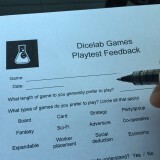 What are your favorite or most useful bits to use when you prototype a game?